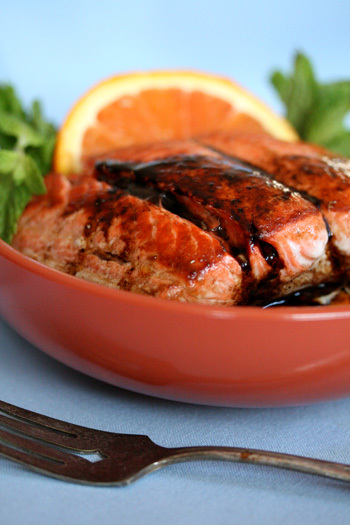 Orange and balsamic make a sweet and sour combo that is perfect with salmon. If you have a sensitive nose but still want to enjoy the health benefits of eating fish, citrus is always a good way to cut the strong sent of salmon. Preheat the oven to 400° F. Heat a large skillet with non-stick skillet with cooking spray and place over high heat. Sprinkle the salmon with salt. Place the filets in the skillet , flesh-side down. Cook 1 to 2 minutes until the fish begins to brown. Turn the fish over, and layer the orange slices on top. Pour the vinegar around the edges of the salmon and slide the skillet into the oven. Bake 10 to 12 minutes, until the edge of the salmon flakes when pressed with a fork but the center is still slightly pink. Add a little water or more vinegar if the balsamic becomes too dark or begins to burn. Transfer the salmon to plates and drizzle the vinegar over. Serve immediately. Nutritional Stats Per Serving (4 ounce filet): 305 calories, 23 g protein, 8 g carbohydrates, 18 g fat (3 g saturated), 62 mg cholesterol, 0 g fiber, 358 mg sodium. Hello Jennifer and thanks for the yummy looking recipe. I’m not a fan of salmon at all though I have been looking for a recipe for salmon that might appeal to me. Well I just found it. The orange + balsamic did it for me! Will be trying this soon for sure. I’ll let you know what I think. Thanks again and I’l be back.